I'm so excited to be featured on American Eagle's blog alongside Nicole (Dainty Girl) and Katelyn (The Skinny Blonde Girl). We've styled a crop top in three different ways. Check out the post here! I've worn crop tops many times on this blog in the past. I recently paired one with a maxi dress, have worn it over a bodycon skirt and also on top of a LBD (little black dress). When I was younger my go-to outfit was always a crop top with jeans or shorts; to this day I still remember having one with a big peace symbol on it, remember when that was a thing? It's just not my style anymore and you'll notice that each time I've avoided exposing my midriff. This makes the outfit more suitable for an everyday routine which usually includes work, meetings and events. Ikat is a really popular print this summer and I've already seen it in fall/winter lookbooks. 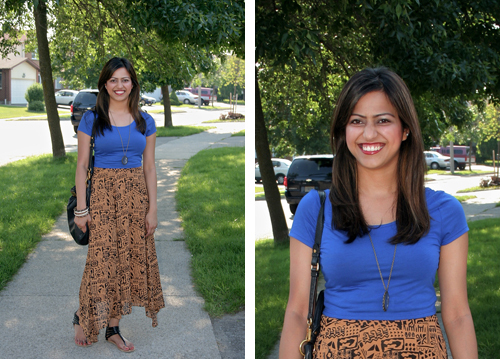 I paired my Ikat hi-low maxi skirt with this royal blue crop top from American Eagle to touch a tad on colour blocking, but to also make the print stand out more. I decided to stay minimal on accessories because of the bold print. How do you style your crop tops? Share your tips with me.